And the browning time in the oven took way more than the stated time in the book. There is some discrepancies in the book...one part says brush with egg wash and bake but the illustrated picture says to dip top on a damp towel and then dip in poppy seeds. I read a blog some time ago. The owner of the blog absolutely LOVES black sesame ice cream. Black sesame! I can't imagine, ever. The smell is very overpowering, and the taste as well. White sesames are alright. 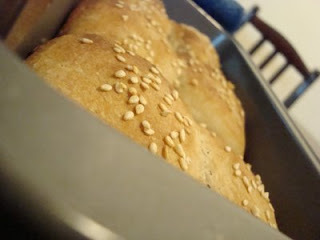 Decided to try this sesame buns, because at that time I haven't tried black sesame seeds before, and what better opportunity to work it into this here dough. Verdict? It produces a nutty bread. 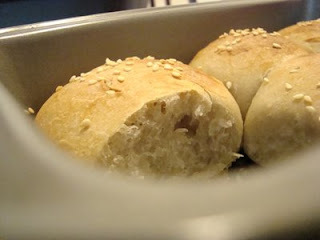 Best served hot fresh from the oven and spread with butter or other accompaniments. Verdict : I didn't get to try it! 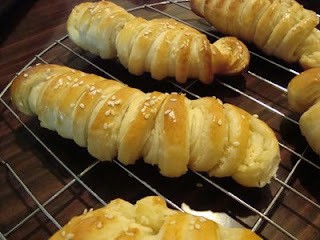 The recipe yeilds two large breads. TWO! Large! And my family members still managed to finish it! Oh well, the second time I make this, I have to squander some pieces just for myself. When I leafed through recipes in the book, I had planned to bake 2 recipes in one go, and both recipes are halves. 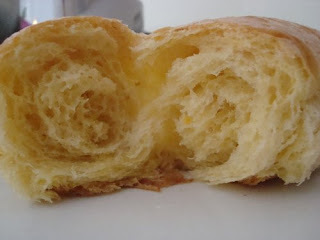 For example, if this recipe asks for basic sweet bun dough, and after first rising, to be divided into 60gram portions, as well as another recipe, then I will make a basic sweet bun dough recipe, then split it in half for both recipes. Which I find, actually isn't helping my family's appetite cause I have to feed 5 other members excluding me. How do I know this? Because these recipes: Kaya Buns and Sardine Buns is proof. 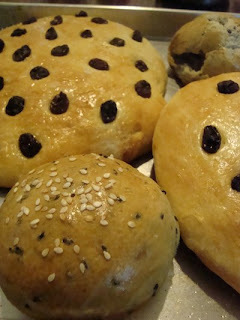 Both recipes ask for basic sweet bun dough. 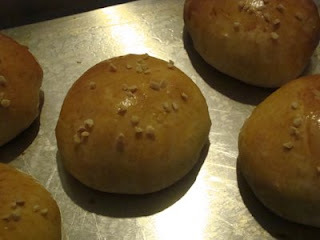 Okay, so I made basic sweet bun dough. 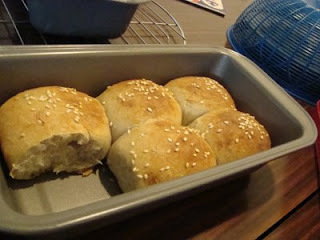 I divided the dough to 10 portions (600grams divided into 60gram portions....10) and made 5 kaya buns and 5 sardine buns. 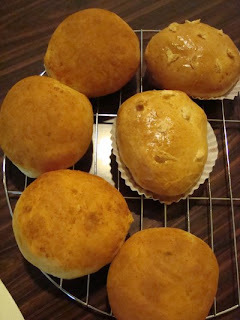 The kaya bun, perhaps the kaya was the only downfall of it, but not much came out of the buns so they still tasted great. See those rolls up there? Those are from the Black Date Rolls recipe, but I didnt' have any red dates paste on hand and had a lot of leftover white lotus paste from past failed lotus mooncakes. So I substitute with white lotus paste. The lotus paste is quite oily..and since I can't see the colour difference between the dough and the paste, when it split it'd be too late to patch. So to test whether I've rolled the dough thin enough without causing the white lotus paste to split, I check hw oily the rolled dough is. Oily? Done. Roll, cut and leave to proof. Which works pretty well. Verdict : Abit too sweet. Should decrease the amount of white lotus paste next time. I did scale it the same weight as for the black dates paste, but perhaps white lotus paste has more sweetness to it. 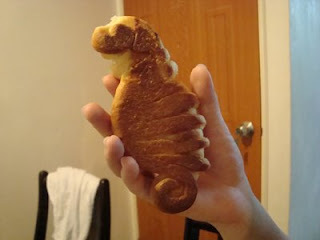 Oh yes, and one of the back of the rolls had a seahorse shape! What a coincidence. 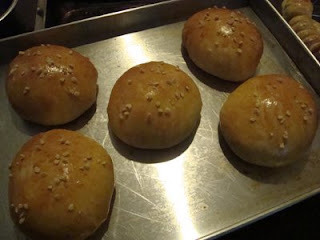 The next buns are the Tuna Buns. 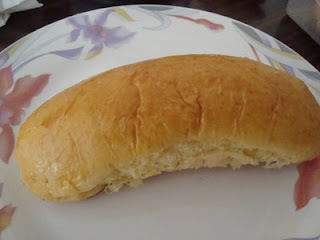 This is one absolutely tasty bun! Best for snacks for midday simply lunch. Really easy to make, and the almond nibs on top makes for a nice crunch! Thumbs up for this one. Wanted to make some plain bread with abit of wholewheat flour in it when I realised I accidentally used all-purpose instead of bread flour! Due to my mistake, I was low on all-purpose but that's a matter for another day. Anyway, I decided to switch to making bagels because I was interested after watching this one chef on Cook Like a Chef making bagels. 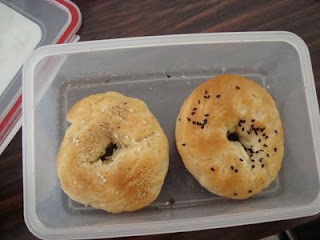 Also because 3 bloggers (Di's Kitchen Notebook, Cookie Baker Lynn and Under the High Chair) had made bagels. Sounds easy? Yeah it is! Although the boiling part did leave me abit surprised...boiled bread? Err...never heard of it.